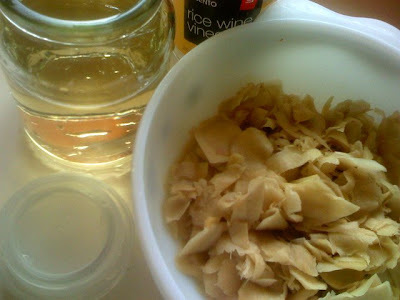 This post is dedicated to my friend Francis who shared my passion for pickled ginger; we managed to gobble a considerable amount before Yoshinoya took it off the tables and gave them in small sachets over the counter instead :-). Francis is getting married this month to Katz. Congratulations! This may be an acquired taste, although it did not take me long to acquire it :-). 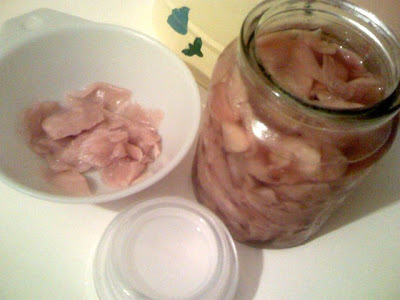 Pickled ginger is a side dish in Japanese food. The spiciness helps neutralize any lingering flavour of the meal, such as sushi. But it also tastes great as part of beef gyudon. Use young and fresh ginger if possible. The skin on young ginger is not dried out like its older counterpart. You can still use the ginger commonly found in supermarkets, though. Since I am the only one here at home who fancies pickled ginger, I only made enough for a small jar. 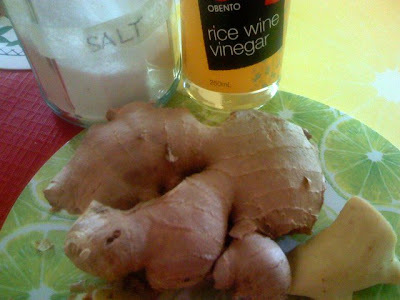 Use a glass jar to store the ginger, preferably one with a glass top with rubber seal. Some reusable coffee jars are designed this way, and I actually used a coffee jar in this case. If you are going to use a jar with a metal cover, make sure that the vinegar and ginger does not touch the metal to avoid affecting the taste. Also, sterilize the jar by submerging it in hot water for around 10 minutes. Clean the ginger then scrape off the skin with a peeler. Slice thinly. Rub 1 tbsp salt into the ginger until completely dissolved. Cover in a bowl and refrigerate overnight. Next, squeeze the water out of the ginger, a small batch at a time just to remove excess salt and water content. Place ginger in jar. In a saucepan, mix the rice wine vinegar, water, sugar, and 1 tsp salt and bring to a boil. Pour the liquid into the jar with the ginger in it. Release bubbles with a plastic spoon, wood or plastic chopsticks, or other non-reactive utensil you may have. Apply the cover and let cool in room temperature before refrigeration. The pickled ginger will last a couple of months refrigerated.